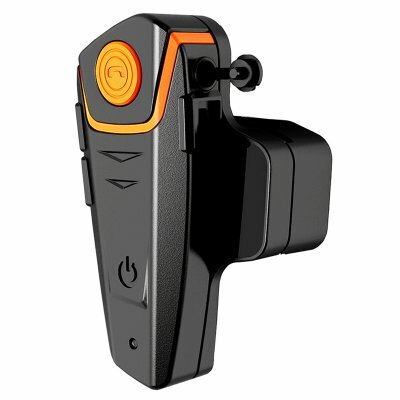 Successfully Added Motorcycle Headset - 1000m Range, Bluetooth, Handsfree Calls, FM Radio, GPS Connect, 450mAh Battery to your Shopping Cart. With this motorcycle headset, you’ll always be able to stay in touch with your passengers and fellow bikers while cruising through the streets. Fitting nearly any helmet out there, this water resistant motorcycle headset is easy to attach and used. It supports multi-user connectivity with a range up to 1KM – ensuring that you and your biker friend will always stay connected to one another while enjoying your upcoming motor trips. Featuring a 450mAh built-in battery, this cool electronic gadget brings along enough power to deliver up to 10 hours of continuous usage time. With all this juice at hand, you’ll be able to embark on the longest of bike trips with your friends and passenger without needing to worry about battery life. Supporting Bluetooth connectivity, this helmet intercom can be efficiently paired with your smartphone. Once synchronized with your mobile phone, it allows you to instantly answer or reject incoming phone calls. Like this, you’ll not only be connected with your fellow bikers through intercom – but also able to make hands-free calls to friends and family back home. Thanks to its 10m Bluetooth range, you’ll be able to keep your smartphone conveniently in your bag or pocket during the entire trip. Bluetooth headsets for motorcycle helmets such as this one can furthermore be used to listen to all your favorite tracks on the go. Whether you like to listen to FM radio, or enjoy the songs from your own music library – from now on you’ll always be able to enjoy those all time classics while driving. Additionally, this motorcycle headset can be paired with your GPS system, ensuring that you’ll never get lost again during your upcoming adventures. This motorcycle headset comes with a 12 months warranty, brought to you by the leader in electronic devices as well as wholesale electronic gadgets..
Operating Range: Up to 10m for cell phones; 600m - 1000m for intercom function. Arabic: - دراجة نارية سماعات الرأس - Chinese Simplified: - 摩托车耳机 - Czech: - Motocykl - Danish: - Motorcykel Headset - Dutch: - Motor Headset - French: - Casque de moto - German: - Motorrad-Kopfhörer - Hebrew: - אופנוע אוזניות - Hindi: - मोटरसाइकिल हेडसेट - Italian: - Serie sterzo moto - Japanese: - バイクのヘッドセット - Korean: - 오토바이 헤드셋 - Malay: - Dengar motosikal - Norwegian Bokmål: - Motorsykkel Headset - Romanian: - Setul cu cască motocicletă - Russian: - Мотоцикл гарнитура - Spanish: - Casco de moto - Thai: - รถจักรยานยนต์ชุดหูฟัง - Turkish: - Motosiklet kulaklık - Vietnamese: - Tai nghe xe gắn máy. Very good material! Received in 4 days by DHL. The product is complete easy in the installation.